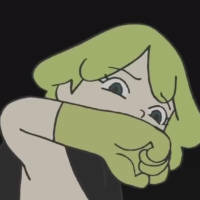 Although raised by avid fans of Studio Ghibli and quite fond of Space Battleship Yamato as a youngster, it took a venomous bite from a rogue TV Tropes article in their last year of high school followed by a steady diet of passable-to-decent video reviews for Julian to turn into that most feared and wretched of all creatures: An avowed anime fan. It was only a few years later that they discovered THEM Reviews, and ever since... well, the place has mostly been the same, really. They're just become even more insufferable. When not trying to convince friends, loved ones and random bystanders to watch Alien Nine with them, Julian spends their free time making experimental music, drawing and writing strange things, and moping about how nobody else loves Alien Nine like they do. Least Favorite Anime: "Let me tell you my feelings on Death Note..."
Favorite Genres: Supernatural and psychological horror, dark fantasy, Ikuhara-core. Least Favorite Genres: 'Death game' thriller, moe harem drama, ineptly sleazy comedy.